I've loved firstly the smell. It's a fresh earthy smell that reminds me of dried herbs and olive oil - it's hard to describe, but it smells ancient (in a fresh sort of way) and with not a bit of perfume (unlike too many soaps I've used over the years). The second thing I love about these soaps is the size of the bar - it's huge! The 600g bars that I use are ridiculously large compared to average store-bought soap - about 4 times as large as a typical bath bar and they are square. At nearly 3.5 inches (or 9cm) square, they are more than a hand full and seem to last forever. In reality a bar will typically last me nearly 4 months - more on that below. Of course, if one is small of hand, soaps in a smaller 300g block or 200g with standard bar soap shapes are available as well. Thirdly, I can use these soaps for my face, my body, washing my hair, shaving (I have always wet shaved with soap and Savon de Marseille is my favorite). Hell, I can even brush my teeth with it if I like. Which I have done - the taste is not too bad (if a bit salty); it's supposed to be great for your teeth by the way (read more about tooth care with Savon de Marseille in this link). Apparently, it is also manufactured in flake form to be used as a laundry soap (which as yet, I've not tried). 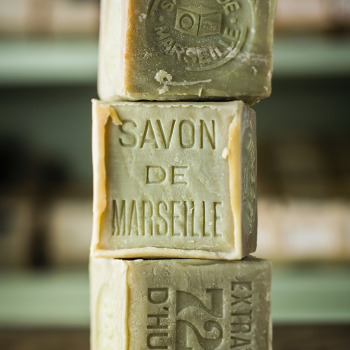 The Savon de Marseille that I like can be a bit expensive and hard to find. I do know of a couple of stores here in Munich that stocks it, but it's a hassle to go into town and I often forget to buy soap when I'm there, so I last year I decided to take matters into hand and just ordered a package of 6 x 600g blocks on eBay. This has ensured that I've had my stock of soap that I love on hand and has made the past years bathing and shaving a true pleasure and saved me a bit of time and money as well. I'm sure all of these handfuls of soap manfacturies have slightly different recipes but would be mostly more similar than different so long as you stick with their original fragrance-free/natural color varieties. For shaving the soaps lather up beautifully and leave a very slick surface on the face, which is needed for a close shave. Also, since there is no perfume and it doesn't dry my skin like many soaps do, it leaves me quite fresh-faced. Lubrication, preparation, etc. are fine. 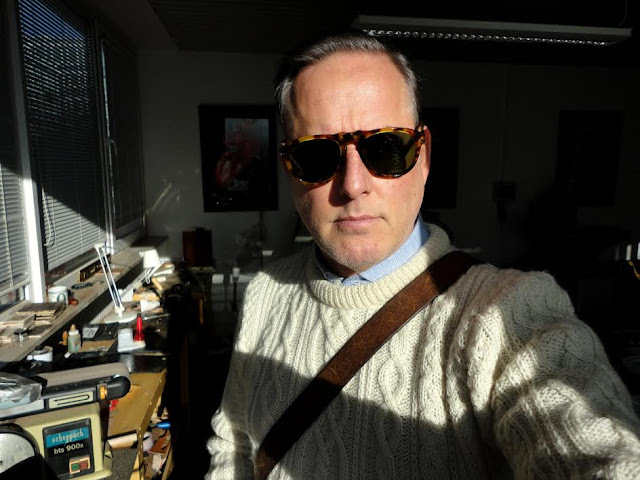 I get a beautiful, baby bottom shave each day with Savon de Marseille. And the olive oil in Savon de Marseille has an excellent cosmetic protective effect on the skin that feels soft, smooth and nice the whole day with a nice subtle odor! As you can see from the above photo, the bar in the bowl has been in service for about 2 months and I would think has at least of a month or two of good service in store. This bars will last and extreme length of time if you keep them dry when not in use (a good advice for any bar soaps). I looked back at when I originally purchased my 6 pack of 600g blocks and it was a year ago yesterday. So far I've used 3.5 bars, which means these things last me nearly 4 months each! Of course, please bear in mind that my wife and daughter prefer to use other soaps for some reason, so it's only me using the soap. But I typically bath, save and wash my hair using the same block, so they do last a fair long while. One note: For washing hair is that it's a substitution for standard shampoo only; I still use hair conditioner as well. All in all, I have enjoyed using this natural soap from Marseille for the past year and am looking forward to using it for another these blocks for several months more before I'll have to think about a re-order.